Kentucky hospitals provide countless services in their communities, from high quality patient care to employment opportunities to significant economic contributions. KHA is here to support hospitals and help them be their best! 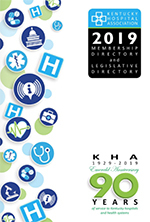 Learn more about KHA's annual sponsors, and discover how your company or organization can sponsor the Association and help all the hospitals in Kentucky find ways to meet their goals.